Mindfindr is an assessment service solution aimed to support organizations when administering and implementing suitability assessments. The service offers various options for arranging assessment data collection processes. The Mindfindr test presents the participant 120 assessment items used to produce a participant profile serving various HR functions. 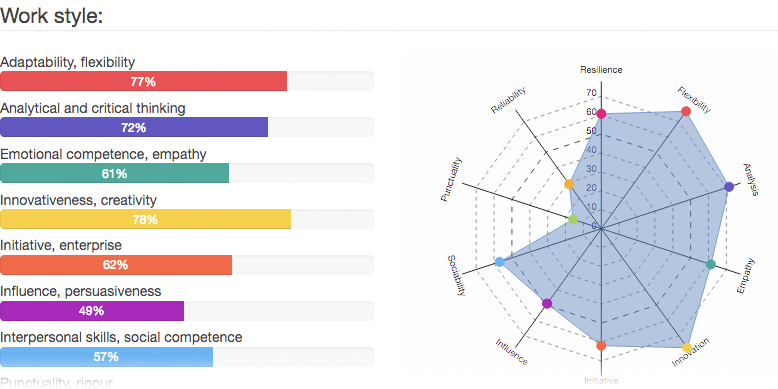 A personality description produced by Mindfindr focuses on such personality traits of the assessed that are considered relevant to work performance. 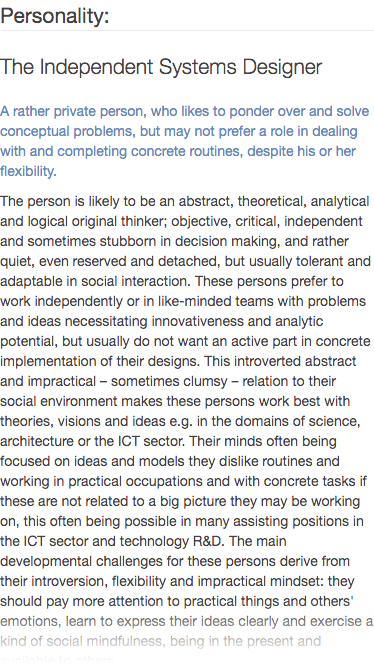 The description is based on a combination of five personality dimensions widely shown to be scientifically valid. An assessed person may also be attributed two somewhat different personality descriptions should the results warrant that. The profile describes general work behavior typical of the assessed. In addition, the profile information covers such areas as interactional and the team work style, special strengths and developmental challenges of the person. The report includes general information on the suitability for, potential for success in, and estimated commitment to various sectors and areas by the assessed. It is important to note that specific suitability estimates are also provided regarding all positions and professions in the service. The report also covers likely developmental challenges typical of the personality features of the assessed where relevant regarding success and wellbeing at work. Competences are such features and strengths of an assessed person that may have differential relevance for well-being, success and development at work in different sectors and professions. Competences are based on the personality, aptitudes, motives and interests of the individual. Competences are known and also scientifically shown to correlate with results of more traditional aptitude tests. A Mindfindr competence profile covers 10 different competences, such as mathematical-logical, linguistic, spatial and physical abilities. The three aspects of the concept of competence - ability, interest and practical experience - make the competence profile of Mindfindr a more comprehensive tool for assessing an individual's practical work performance and well-being at work compared with traditional aptitude tests or interest inventories. The report thus covers all information yielded by personality and competence perspectives to predict performance in positions optimally requiring differing combinations of strengths. Usually people are cognizant of their competences and look to utilize and further develop those at work or in hobbies. Very often people have strengthened their core competences through training or work experience. The leadership index describes to what extent a person might succeed in or find meaningful functioning in leadership positions defined comprehensively, covering such regular activities as planning, organizing, and supervising the implementation of decisions made, as well as leading people, this usually requiring some assertiveness and a liking for being socially present. While not finding a formal leadership position meaningful, some personalities may readily take leadership roles in social everyday encounters or act as a temporary leader in other arenas. The estimate of the leadership and managerial inclination is based on an assessed person's temperamental style. It yields an estimation of the person's readiness and natural disposition to take responsibility, his or her ability to effect and implement things and to genuinely take on leadership roles also in new and stressful situations. The estimate is also affected by the person's social skills as well as his or her willingness and motivation to perform in managerial and leadership roles in practice. When considering a person's suitability and motivation especially for leadership and managerial positions it is worth taking into consideration the person's potential leaning towards various leadership and managerial styles, besides the overall estimate of the strength of this tendency. These nuances may e.g. show that even though a person did not have a very strong drive to manage, he or she might have resources for instance for a coaching kind of leadership position based on the personality type. Position and profession specific suitability estimates are based on the information provided by the assessed regarding their personality features, competences, work style and leadership potential. When modeling and estimating the suitability of the assessed these strengths and interests are combined e.g. with work definitions presented e.g. in the ISCO categorization system, while also general ideal interest structures defined by Holland are included in the modeling. When used to facilitate career planning, the consultant and the assessed person may decide which level of training to choose to go through listed positions and professions. Regarding recruiting processes occupations and professions are categorized in 7 classes (from "no vocational training required" and "workplace/hands-on training" to "academic continuation training") according to typical minimal training requirements. Mindfindr analyses and differentiates in a complex fuzzy process between various competence potentials relevant for any given position as well as the corresponding desired qualities (e.g. personality, abilities, leadership qualities) evinced by the assessed person. When using a Mindfindr report it is important to note that even though the applicability and relevant competences of a person were assessed as being very modest or low for a particular position, he or she might be very suitable for other positions. In a work style description the work style of an assessed person is depicted using 10 work style dimensions. These are presented and defined in graphs and tables that enable evaluation of an assessed person's work style to consider to what extent the person is likely to meet the requirements of a given position when defined using the 10 work style dimensions that are listed in the table. A practical work style is partially based on the personality, competencies and preferences of an assessed person. However, it describes the work style of a person more concretely. The work style description covers such dimensions as punctuality, initiative, sociability, influence and analyticity. When considering a person's overall applicability for a particular position in an organization, it is useful first to analyze the person's estimated general suitability for the profession or position. In addition, the work style profile will yield more practical information on the person's concrete work performance. Any two persons with similar general suitability estimates for a position may have different work style profiles differently compatible with the practical work environments. Team compositions, organizational cultures, or particular needs of clients may affect which work style profile meets various requirements of clients best or optimally complements a team. Different models of team structures give various numbers of team roles that are considered important to make any team function optimally. The Mindfindr model covers eight different team, group or executive board roles. These are such as e.g. the inspirer, the finisher, the organizer, the analyst and the challenger. The roles and special contributions brought by each role into teamwork are given in a table. 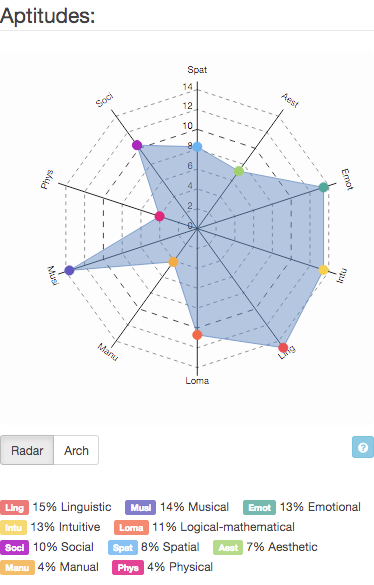 For an assessed person the strengths of each role are described in a graph. 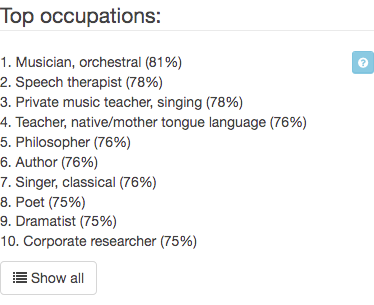 Additionally, three strongest roles are highlighted as the most suitable ones for the assessed. Team analysis information may come handy in many ways: when creating a new team through recruiting or when considering sharing responsibilities and ascribing roles among an executive board. When coaching a team, a group or a board, a team role analysis may help improve communication through providing a deeper mutual understanding between team members. Similarly, the analysis may be used as a tool to approach and resolve communication problems in organizations. 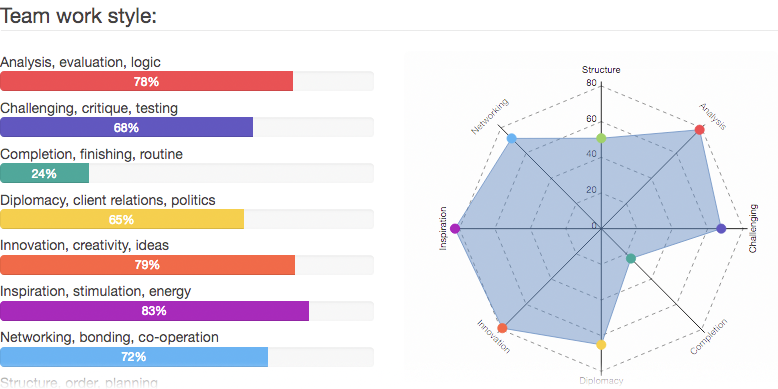 Like other Mindfindr instruments, the purpose of the team role analysis is to help allocate human resources optimally in organizations and point out competence gaps, also in teams and executive boards. It is evident that if a creative team lacks an organizer, the implementation of ideas may take time. On the other hand, an executive board wanting a diplomat or a networker may disregard the needs of potential clientele. The Mindfindr leadership analysis covers three levels. A general leadership potential index gives a rough estimate of a person's inclination to leadership on a five level scale. Additionally, all assessed persons fall into one of four leadership type categories. These are process leadership, results-oriented leadership, developmental leadership and change leadership. The third aspect substantiates and further defines leadership styles of the assessed. These eight leadership styles include such styles as e.g. the strategic implementer, the inspiring coach, the emphatic maintainer and the participating supporter. The analysis may be used to gauge leadership qualities of a coachee at the start of a coaching process, or to find out what kinds of leadership perspectives are potentially underrepresented among an executive board. When considering a person's suitability and motivation especially for leadership and managerial positions it is worth taking into consideration the person's potential leaning towards various leadership and managerial styles, besides the overall estimate of the strength of this tendency. These nuances may e.g. show that even though a person did not have a very strong drive to manage, he or she might have resources for instance for a coaching kind of leadership position based on the personality type.